This Crayola-themed toothbrush features xoloured LED Lights flash for 60 second intervals to help kids brush longer. 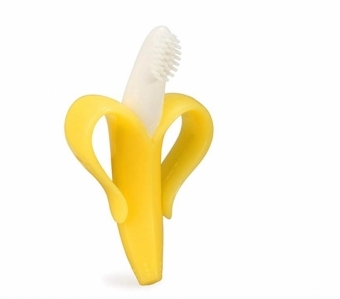 This adorable banana-shaped, food grade silicon toothbrush and teether in one helps children develop good dental care habits early. Made in Canada, these handcrafted tooth fairy pillow pals are one-of-a-kind! Brilliantly awful gnashers make a gruesome addition to any costume. They look so real you might have to look twice! A great teaching tool for teachers and parents, this human teeth model will help children learn how to brush and care for their teeth.